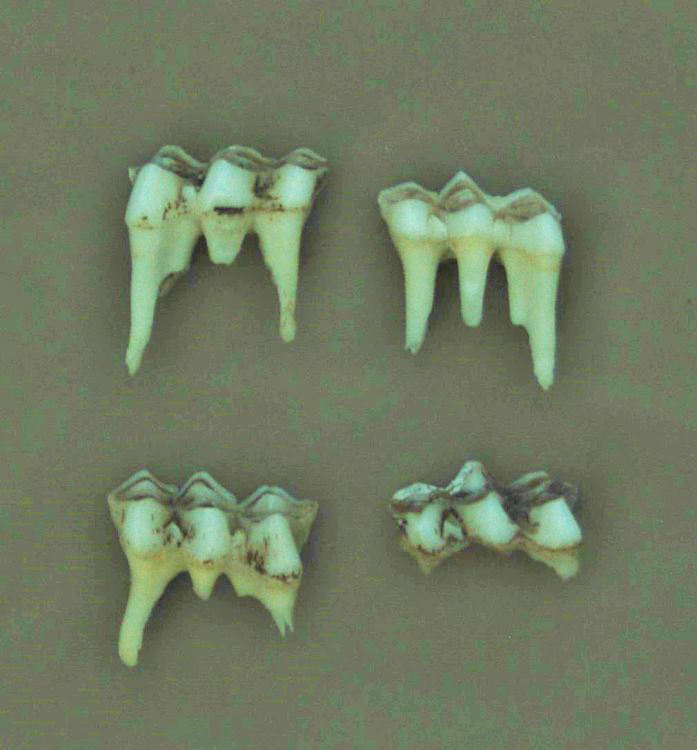 The stages of eruption of the third molar in yearling deer is clearly visible in this photo: Jawbone No. 5 shows the replacement of the temporary premolars with the new permanent molars. The key to aging yearling deer — deer that are 1 year old— is the third premolar. The third premolar is a temporary tooth that has three cusps (or crests.) Both fawns and yearling deer have this temporary three-cusped premolar. As discussed in Part I, fawns will only have one molar erupted. As the fawn grows older, the second molar begins to erupt, followed by the eruption of the third molar. So, the difference between a fawn and a yearling deer is the addition of the second and third molars to the lower jaw. As the yearling deer approaches the 2-year age class, these temporary premolars are replaced with permanent premolars, with the third premolar now having two cusps. This two-cusped premolar is now the key for separating the yearling deer from 2-year-old (adult) deer. This will be discussed more in the next part when we look at the young adult age classes. It was also discussed in Part I that because during hunting season deer are at the halfway mark for the year, they are aged as 1 ½, 2 ½, 3 ½, etc. The three-cusped temporary premolar is the key for aging fawns and yearling deer. The three crests or cusps of these temporary teeth have already begun wearing down. At 18 months, these temporary premolars are replaced with permanent molars. Deer that breed early in October and November have fawns born in May and June — so the half-year increment fit well for aging purposes. But late-breeding can be a little challenging since the fawns are born late — and tooth eruption is behind early-born deer. However, the third temporary premolar with the three cusps is the key, even though they may not have the full complement of molars in the lower jaw. 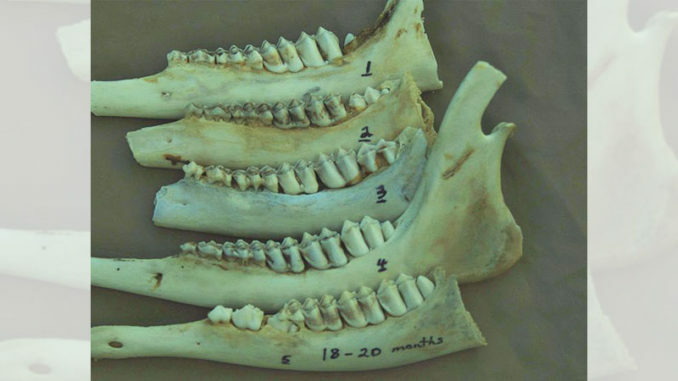 The typical early-born yearling deer jawbone will have the three temporary premolars, with three molars that are fully erupted in November and December. As these deer grow older, the temporary premolars may begin to break apart and be replaced with permanent premolars in January. This generally occurs around Month 18. The typical late-born yearling jawbone will have the three temporary premolars, with only two molars fully erupted in November and even December. As this deer grows older, the third molar will begin to erupt — and by January will look like the Area 2 jawbone in November, with the three temporary premolars and three molars fully erupted. Generally, these deer do not begin to shed their temporary premolars until after hunting season, although those fawns born in late-July or August may begin losing these premolars in January. These yearling deer are basically adult deer; yearling does should breed and produce their first fawn, and yearling bucks grow their first set of antlers. This is the age class of bucks that most hunters pass up with hopes that their antlers will grow larger over time. For best antler development, a yearling buck should weigh at least 120 pounds or more. Yearling bucks that weigh 100 pounds or less are generally small spikes, and unless there is quality nutrition on the landscape, they will not catch up to those deer that weigh 120 or better. If the yearling doe body weights are low, they may not be successful breeders and may not produce a fawn at age 2. Once again the key is that third temporary premolar with three cusps or crests. Fawns will only have one molar, and yearlings will have two or three molars. In the typical deer herd, these two age classes represent two-thirds of the herd, but are the two age classes that are often passed up by hunters. Keep in mind that if you are trying to manage and monitor the growth and development of your deer herd, some deer from these two age classes should be harvested in an effort to understand growth trends and identify potential problems.